Most of our products can be purchased in store however it is a good idea to call or email before your visit to confirm we have your item in stock. Free parking is available at the rear of the building in the visitor parking lot: SIGN IN WITH SECURITY IS REQUIRED. 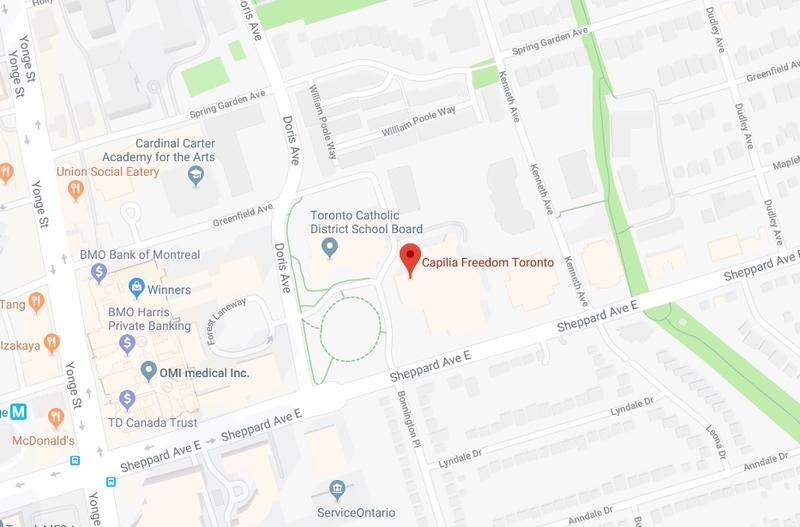 The Freedom Store website is operated by Capilia Freedom Toronto, a full service hair removal, esthetics, and hair replacement clinic located in Toronto, Ontario. Operating since the early 1970's, we have a strong dedication to customer service and one of the best reputations in the industry. Our hands-on experience gives our customer service team a unique advantage over all other online sales websites: we have the personal and professional experience with all of our products. When you call, you will talk to someone who actually knows what they are talking about! Our knowledgable staff can help you decide on the best products and treatments for you. We provide unlimited phone and email support, as well as personal consultations and demonstrations in our clinic. Feel free to contact us with any questions or concerns you may have. At Freedom, we want you to be happy with your products and service. We are not just resellers, but specialists in the products and services we offer.